In the Northern Massif region of Hungary, the famous Egri Bikavér, or “Bull’s Blood Wine” is made in the area around Eger, a beautiful town about halfway between Budapest and Tokaj. The name of the wine dates back to a Turkish invasion led by Suleiman the Magnificent around 1552. During the invasion, Suleiman the Magnificent and his army of Turks attempted to siege of the Castle of Eger. The defending Hungarians, led by Captain Istvan Dobo, were largely outnumbered by the invading army and the situation appeared dim. However, the Hungarian forces, fortified by days and nights of delicious food and large amounts of the local red wine, managed to successfully defend Eger. In doing so, the Turkish army was forced to withdraw, and Turkish westward expansion was delayed for forty years after this battle. According to one legend, the enemy soldiers were frightened by the fierce fighting and red wine-stained beards of the soldiers. Among the Turkish soldiers it was rumored that bull’s blood had been mixed into the wine, as otherwise the strength and firm resistance of the town and castle could not be explained. Another legend states that the swords of the enemy could not cut through the Hungarian blood thickened by the wine. 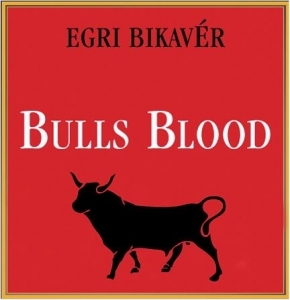 The wine named for the legendary “bull’s blood” of the siege, Egri Bikavér, is still produced to this day, and is very popular on both the domestic and international markets. Egri Bikavér is made up of a blend that has varied over the years, although the blend is anchored by the ancient Kardarka grape. Kadarka is a difficult grape to vinify, and has increasingly been replaced by Blaufränkisch, known locally as Kékfrankos. In modern times, Egri Bikavér must contain at least three of the following 13 grapes: Kardarka, Kékfrankos (known as Blaufränkisch in German), Blauer Portugieser, Cabernet Sauvignon, Cabernet Franc, Merlot, Menoire, Pinot Noir, Syrah, Turán, Bíborkadarka, and the modern Austrian hybrids Blauberger and Zweigelt. Great Story. I actually had this wine about a year ago. Someone brought it to a party – one of those guys who buys the wine based on its funny name, but no one knew or mentioned the story beind the wine. Thanks!